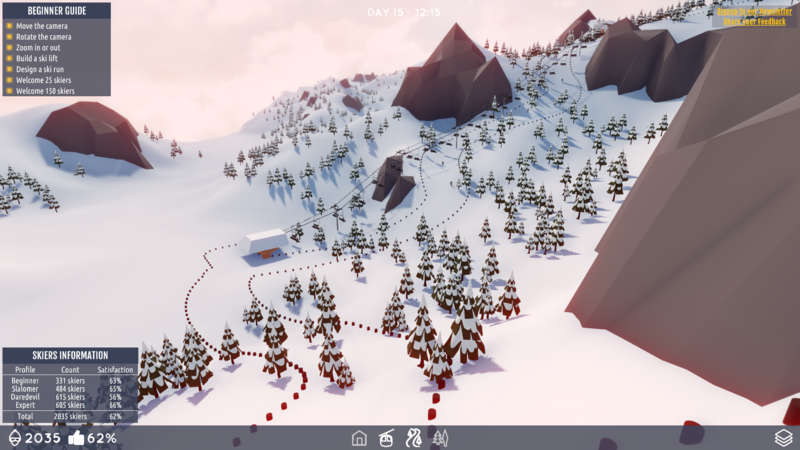 This is quite the interesting alpha build you have got going! I spent a while fiddling with it and found it enjoyable - even if it's rough around the edges. I sent you guys a feedback form - hope it's useful. This is turning out to be a great game, looking forward to it a lot! I just made the park you see above. The number of guests is stil going up rapidly. I just have a few lifts, so they're almost all near or at max capacity hahaha. 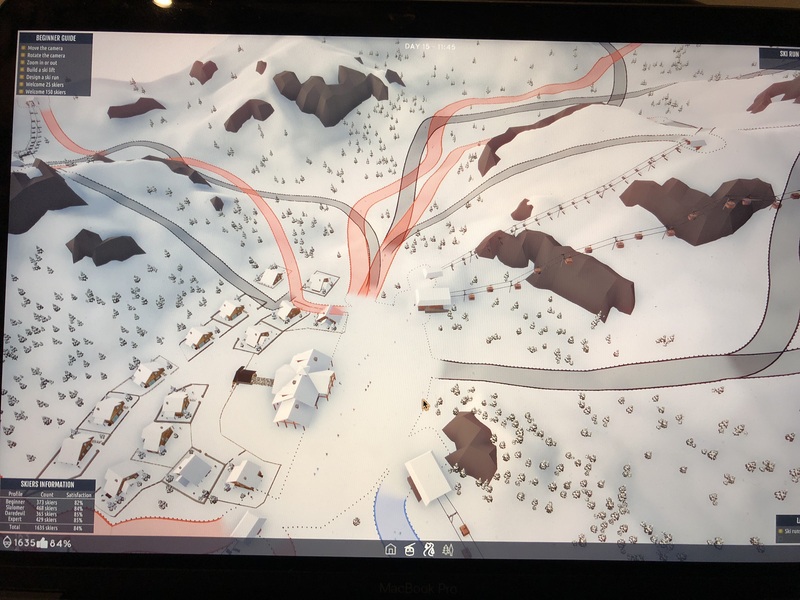 Love the fact that there's actually 3 different 'villages', and the pathfinding between those 3 and all the slopes seems to be really good. Was fun to play around with! 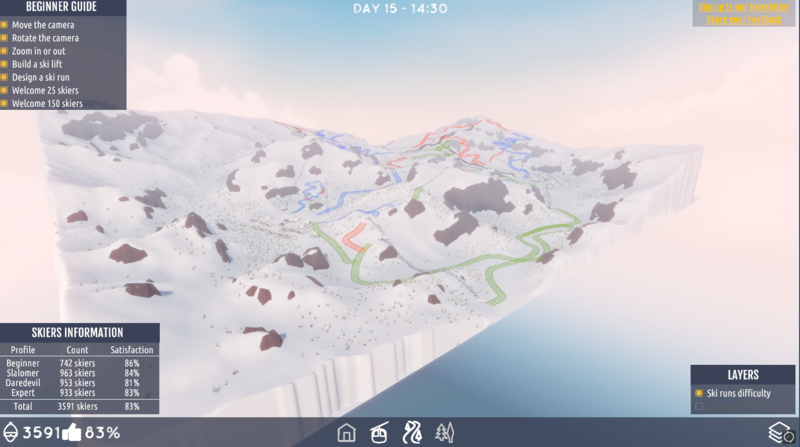 Took a shot at the alpha and built a horrible nightmare park of endless runs and chairlifts - guests loved it! Haha. It's has a promising start to build off of, but it was still a little too sandboxy at this stage. I play the occasional tycoon game and resource management and all those various factors to keep an eye on are big selling points for me. I'm interested to see how the game will play once that stuff is added in (assuming that's your direction). The visuals are nice and clean and the music is great! Reminded me a little of the Risk of Rain soundtrack, which is stellar. Anyways, I'm curious to see how this game will turn out as development continues. Included more of my impressions in the video below. Good luck with it guys! I saw the video on youtube and added it to our playlist. Thanks! 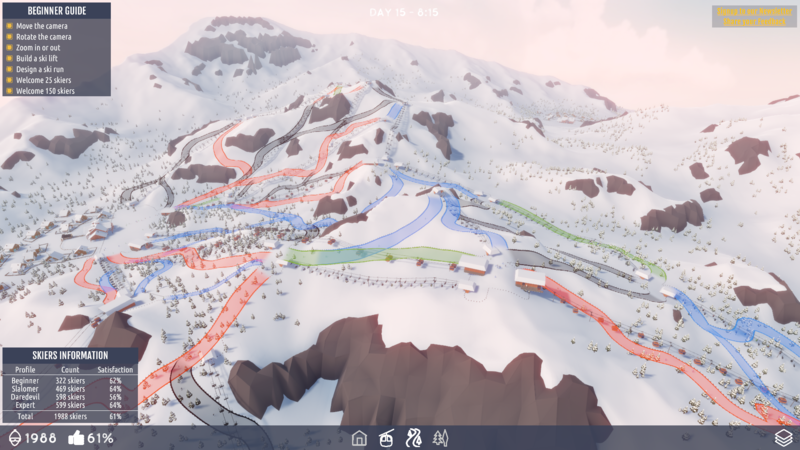 Hope you'll be there when we'll add some content :) Cause yes, this alpha was meant to be a sandbox and we're planning to add management elements. See you then! Loving the game so far even though it has limited options. A few minor bugs such as the ones mentioned in posts below. I definitely think this game has a lot of potential and would love to play this on my stream when it's getting closer to actual release! Again, loving the game so far, and excited to see where it's going! Happy holidays! Thanks for playing the alpha! We can't wait to add more content and gameplay. Hope to see you then! Great Game Guys! I really enjoyed playing it! However sometimes my game froze right when I wanted to place my track and, when it returned, the track was already placed in a way I didn't wanted. 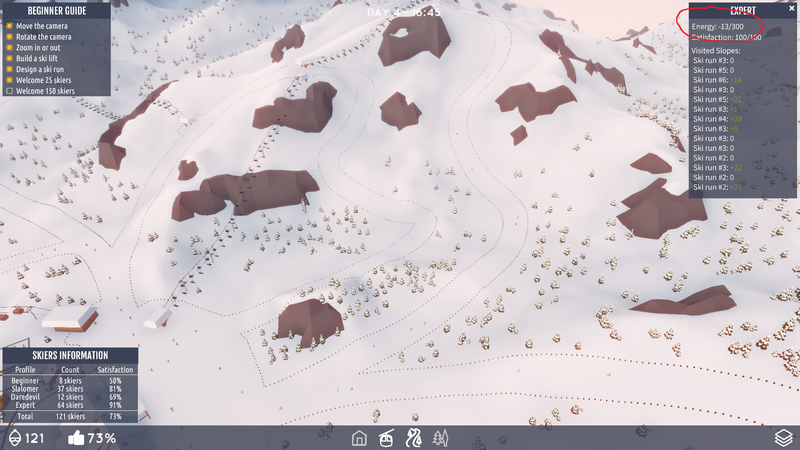 Next, when u pass 999 skiers it shows the number on 2 lanes(I saw that someone else had this issue). 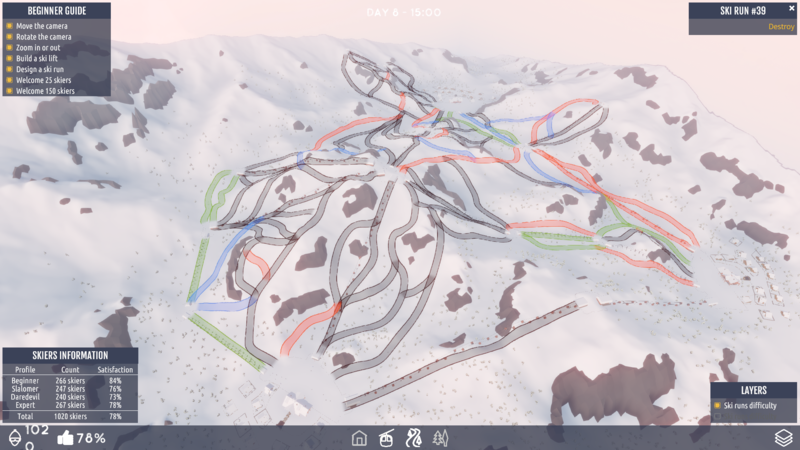 Even though I had around 2k skiers, the tracks were still not as full as I expected. In my opinion they should be almost full with so much people. Besides that, I think a financial section added to the game will make it more addictive but it s likely that you are working on this. And a question: Why are my skiers unhappy although they have enjoyable tracks and plenty of them to ride. Those are my thoughts about the game. I think it will rock! Good luck! And btw it s freezing to me too every 2-3 seconds. I have i7 8750H with gtx 1060 6gb so I guess it isn't about the power of the laptop. 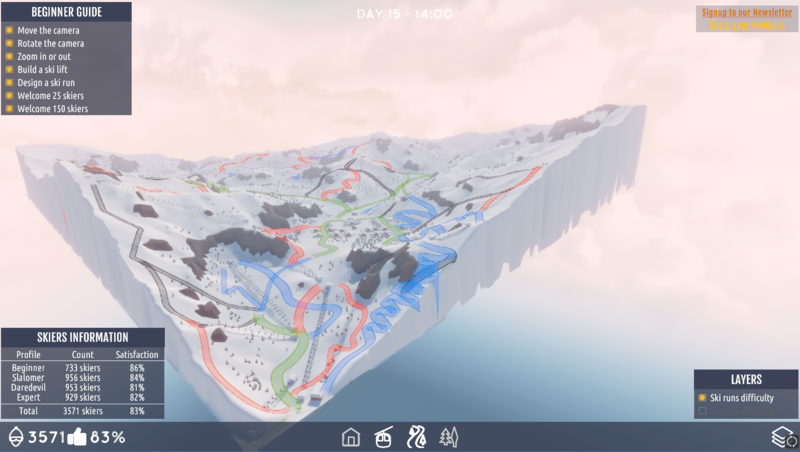 It happened since I had 2-3 hundreds skiers. Hi! Thanks for playing the alpha :) We still have a lot of optimization to make. Freezing issues should be fixed then (well, that's the plan). About tracks not being full enough, I don't now yet what we'll do about it, but your feedback totally make sense and we'll keep it in mind. Last: if your skiers are not happy, did you checked log entries? 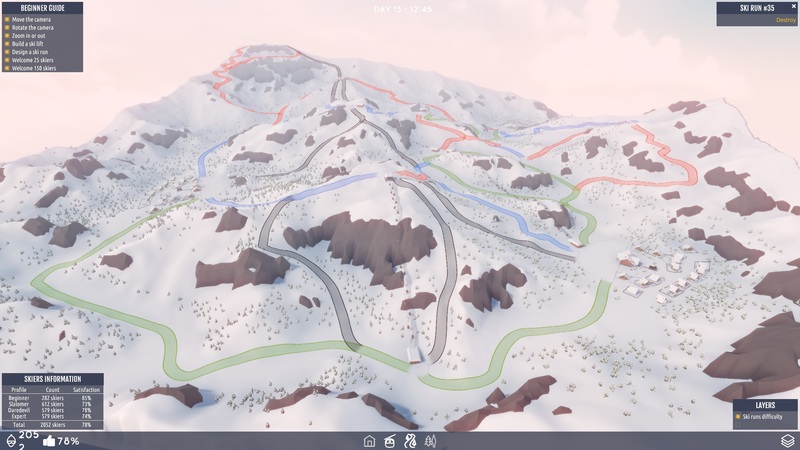 If you select a skier, you should have a look at it. This may be because I have a laptop/don't use a mouse or maybe just because I'm dumb but I can't figure out how to zoom in/out and rotate the camera. Hi! You can change the controls while launching the game. But yes, zooming and rotating need a mouse with the original configuration. Would love to play this, however the game won't launch for me. It first recognized it as a virus and my pc would delete the file. I put it in quarantine but it still won't start the game. I have an i7, 16GB RAM and a 1050 so i guess that's not a problem? ant ideas? Well, that's strange... We'll see what we can do (let's hope we can do something about it). Great game !!!!! so glad i can play it on 32bit computer too!!!! Thanks again! Really great talent! Thanks :D We're glad you enjoyed it! !